The Trout Zone: Book Review: "Selectivity: The Theory and Method of Fly Fishing for Fussy Trout, Salmon, & Steelhead"
Book Review: "Selectivity: The Theory and Method of Fly Fishing for Fussy Trout, Salmon, & Steelhead"
Books. I can never get enough of them, fly fishing ones in particular of course. Some books prove to be better than others. When I was first contacted by the editor at Stackpole Books about the possibility of a book review, I quickly accepted. Mostly it was just because of the title, Selectivity: The Theory and Method of Fly Fishing for Fussy Trout, Salmon, & Steelhead. Later, when I had the opportunity to do a question and answer with the author, Matt Supinski, my excitement grew again. 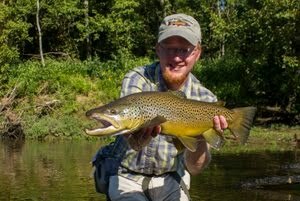 This time it was because Matt let it slip that when it really came down to it, he preferred big, fussy brown trout over all other fish. Hey! I can relate to that. Matt's qualifications for writing Selectivity are impeccable. He has spent a lot of time with some of the legends of our sport including Vince Marinaro and Carl Richards. Both of these anglers played a large role in guiding Matt's growth not only as an angler, but specifically as a selectivity expert. 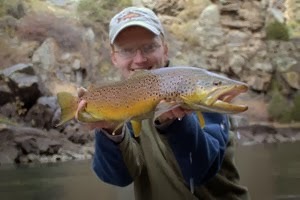 Matt has fished throughout the world, but still prefers the legendary spring creeks right here in the United States, such as the Paradise Valley creeks in Montana, above anything else. My first glimpse of the book produced a good first impression. The hardcover book has a beautiful dust jacket with great photography. Opening the book, I was already expecting more of the same and was not disappointed. Matt Supinski is very engaging as an author because he has the ability to drive home a point through the use of stories. 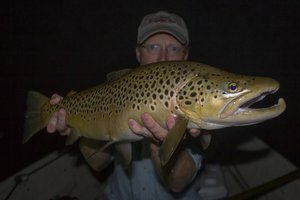 The "theory" of fussy trout can be quite dry, but Matt has found a way to combine the textbook information with tons of practical stream side applications and stories. Early in the book, he introduces the central idea behind this book, which is the fact that there are three phases of selectivity: aggressive/active, selective/reflective, and passive/dormant. Throughout the rest of the book, Matt delves into each phase by breaking it all the way down to each species. The dialogue with the reader is supported by many fantastic photographs from some of the best anglers and photographers in the sport. The book also has inserts in various chapters highlighting a key point through a particular story or a study of a particular stream. One of my favorites is a section called "The Catoctin Creek Conundrum: When Mountain Freestone Trout Behave like Spring Creek Sophisticates" (p. 56-57). While most people think that trout born and raised in the freestone streams high in the Smoky Mountains are always easy to catch and relatively stupid, I would beg to differ. 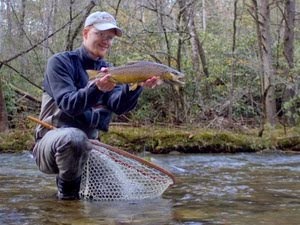 I can recall a particularly nice brook trout, one of the largest I've caught in the Smokies in fact, that came up and eyed the fly slowly before refusing. It took several casts, all of which I thought were perfect, before I caught that fish. On another trip, I remember a little 6 inch rainbow that I fished to for 20 minutes before cracking the code and hooking up. 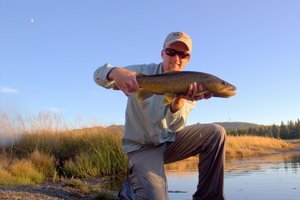 Could I have moved on and caught plenty of trout working the fast pocket water? Definitely, but that's not the point. Figuring out that fish is what I wanted to do, and that is what Selectivity is all about. If you are a beginning angler, this book will be a wealth of knowledge that will cut many years off of the learning curve. If you are a veteran angler, Matt Supinski has finally compiled just about anything you will ever need to know about tough fish all into one spot. I have learned a lot already and as I read and reread this great book, I'm sure I'll continue to absorb more and more information. One specific item that any angler will benefit from is the All Systems Go Checklist (p. 62). It helps the angler focus on exactly how to go about fooling difficult fish. The four checks (#1 Wings, #2 Shape and Body Size, #3 Color, Translucency, and Hue, and #4 Behavior) is much like a formula for figuring out a tough fish. As a mathematician, I like formulas so this jumped right out at me. Another tremendous benefit of this book are the full page photographs of flies. Also, at the end of the book, Matt provides full recipes for all of the flies he shares (p. 207-253). The book is worth a read just for the information it contains on fly patterns, much less everything else it contains. I've already been inspired at the bench because of reading this book. Overall, I can definitely recommend this book to anyone who fishes for trout, salmon, or steelhead. The entertainment factor is an added bonus right now that the weather is so cold. If you can't be out fishing, at least you can be honing your skills by reading this book and preparing for the spring hatches which are soon to follow. For complete disclosure, I was sent a free copy of this book by the publisher for review purposes.